Teach your pet remotely with treats. 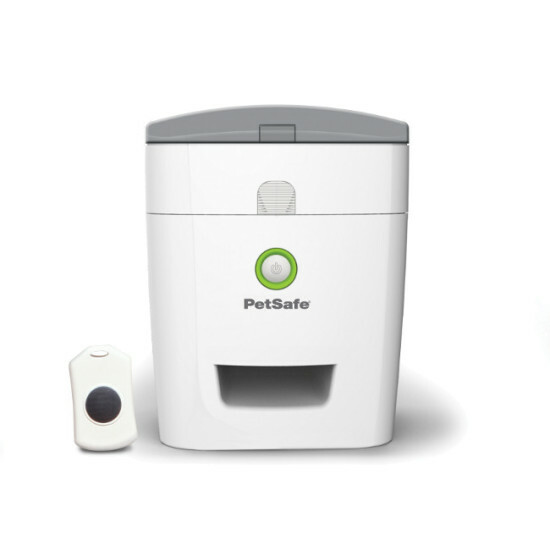 The handheld remote activates the treat dispenser from up to 25 feet away, so you can reward good behavior immediately. Use it to keep your pet away from the door when a visitor arrives, to reward your pet for not barking, and for many other training purposes. The treat dispenser can be mounted to a wall or free standing, has a low battery indicator, and is AC adapter compatible. Redirect your pet's bad behavior with a command for the behavior you want. The treat dispenser lets you reward your dog for good behavior and easily teach new commands with the power of positive reinforcement. Train 1 dog at a time. Teach your pet 1 new behavior in 10-minute sessions every day for a few weeks. Train when your dog is hungry. Hand feed your dog until he's comfortable with the dispenser. If your dog tries to bite or paw at the dispenser, change his focus to you. When he stops and gives you good behavior, give a treat from the dispenser. Place your dog's bed near the dispenser. Use a leash to bring him to the bed. Use the remote to give your dog a treat when he has all 4 paws on the bed. Add the command by saying "Place" and giving a treat when your dog is on the bed. Give your dog the "Place" command to make him go to the bed, then give him a treat.